Happy New Year! I think there is no better way to kick off 2014 here in the east coast than with a nice good old snow storm. Unfortunately I am still in the office working so hopefully I’ll get to leave before it get’s bad out there. If you are lucky to still be on vacation or at home trying to weather the storm, here is a good Scotch that can help keep you warm. Very recently I purchased a Glenfiddich 15 year-old. According to their website Glenfiddich is Gaelic for Valley of the Deer. I ended up purchasing this 15 year-old because it was on sale and well, because it’s Glenfiddich and it is nice to have in my collection. 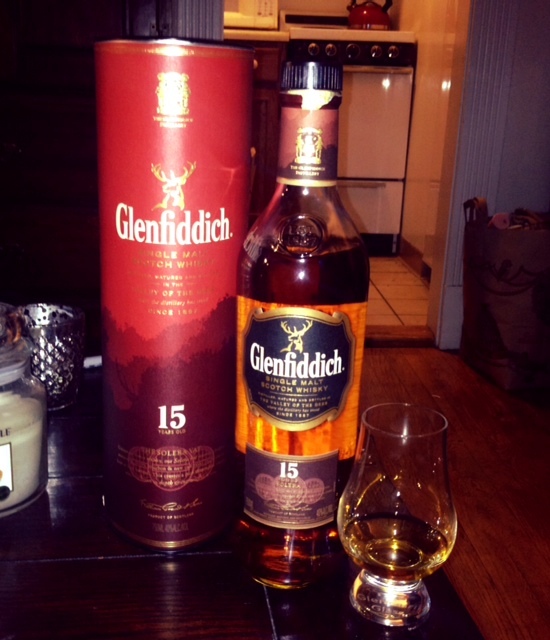 I was lucky because the first Glenfiddich I ever tried was their 21 year-old (see August 05, 2013 post) http://wp.me/p3Zt2k-o. I loved the 21 year-old, so needless to say, I wasn’t sure how I’d feel about trying their younger years. I’ll be honest; I felt that after having tried their 21 year-old I would be disappointed with their 15 year-old. I could not have been anymore wrong! This 15 year-old is just as smooth as their 21 year-old. It certainly explains why their site states that they are “The world’s most awarded single malt whisky”. What is unique about this 15 year-old whisky is that it is matured in three different casks, sherry, bourbon and new oak and married in a Solera Vat. If you are wondering what this means well, Solera is actually an aging process and Solera is the name of the barrels used in the process. A basic explanation of the process, the whisky is aged by fractionally blending whiskies of different ages. This is done throughout the years and it is the oldest Solera barrel that is eventually tapped for bottling. Finish: Extremely smooth. I felt a burn inside my throat that was extremely delightful. It left me feeling very warm and happy. If you recall from my August post, the 21 year-old bottle averages at about $120-$140 which is pretty expensive if you are watching what you spend your money on. The 15 year-old averages at $50-$60 depending on where you buy. Both of these are worth the price, but I must say especially after the holidays, I’d recommend going for the cheaper one because for the price, you are still getting an amazing product. This 15 year-old didn’t disappoint. If you’ve tried either one or both, let me know your thoughts on the product. I’d certainly love to hear from you. Happy 2014, may it be a great year!